All four seasons, I love chili. Especially green chili. I call this red and green chili because it’s a little of both. So I decided to wrap up my soup series with this little kicker. If you like your chili spicy, this is the recipe! You can pour it over a baked potato, smother a burrito or eat it straight from the bowl. If you don’t like your chili quite so spicy, reduce the amount of green chilies and chili powder for a milder version. Heat pan and add oil, when hot, add onion and garlic. Stir until lightly brown. Add chilies. Stir well. Add tomato sauce, tomatoes, beans and spices. Bring all ingredients to a boil. Turn down heat and simmer for 30 minutes so all flavors have a chance to mingle. Serve hot. 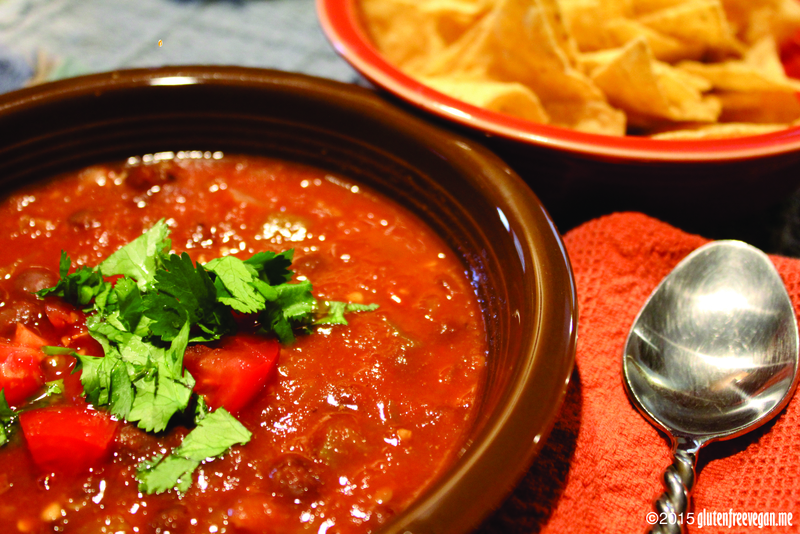 Top with fresh chopped cilantro, fresh tomatoes and/or a bit of shredded vegan cheddar cheese or vegan sour cream. This entry was posted in main dishes, soups and tagged gluten-free, glutenfreevegan.me, glutenfreeveganme.com, green chili, healthy, red chili, san marzano tomatoes, spicy, vegan cooking, vegan recipes. Bookmark the permalink.